Building blasters and props from scrap and junk can be a lot of fun and best of all it’s cheap! This is a cross post with The Prop Weapons Co-op, a cooperative I’m lucky to be a part of with some other fantastic prop makers. Like most people I don’t always have a huge budget, so I thought a post about how to make a blaster out of what is essentially rubbish – bits and pieces laying around – might be useful. Before I started this steampunk raygun slash Dan Dare prop gun build I looked at what I had laying around and spotted an empty Sprite drink bottle, it had these cool divets in it and of course looked like the body of a retro raygun blaster. I have an old hot glue gun that I’d kept because it was essentially a grip and trigger system, thought it might come in handy. If you’ve looked and nothing is jumping out at you, just keep in mind most blaster props have pretty obvious sections, the main parts being a body / barrel and a grip, then smaller bits, trigger, maybe trigger guard and various doodads. Right, hopefully something has come together. From junk to retro raygun blaster pistol – pew pew pew! Gluing this together turned out slightly messier than expected, but work with what you’ve got. That gave me the idea of the riveted ‘metal’ surrounds around the grip, it hides any mess and adds some great texture to the base of the blaster. 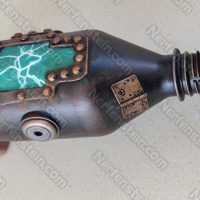 The parts list for this retro raygun include: an old plastic sprite bottle, a broken hot-glue gun, a medicine cup, C02 tube, irrigation switch, foam, craft gems and of course primer and paint. As usual once you’ve glued it all together, sand it back to give the blaster tooth for the paint to adhere to, prime it and then hit it with some paint. I wanted this to have that steampunk feel (even though it isn’t steampunk per se) so I went with a black base and a brass and copper dry brush as the main scheme, some ‘rust’ with various shades of green and orange around some of the rivets (though that’s hard to make out in these images… sorry!). As you can see it’s not too bad for a scrap build, not really great for harsh play, but great for display and if you took more time with it you could weight it also. I hope you’ve found something useful in this post, get looking at things around you, at their shapes and makeup and when something jumps out at you, nab it and get to work. Scrap build raygun post written for GirlyGamer.com.au home blog of Nerfenstein… the geek you can catch up with on her Facebook page, or if you Tweet… there’s always Twitter! I cannot believe form that first pic you end up with such a gorgeous looking prop. Awesome design. The paint job really makes it. Using soda bottles as bases is cool too because you can make multiple interchangeable heads, building them on bottle caps, then screw them on to the body. Its a trick I’ve used before, gives it lots of fiddly bits that makes it fun to use. Henry you are a genius my friend, I cannot believe I never thought of that, it’s so clever and simple! Ray gun suppressor? Yes please! Thanks for taking the time to comment and share that little gem with myself and my visitors. What is the irrigation switch for?